Saat rentouttava loma, et voi voittaa tätä irrotetaan mökki sen allas suuri suljettu puutarha; asettaa keskuudessa vehreiden kukkuloiden saaren, se on huolella restauroitu tarjoamaan kaikki modernit mukavuudet, mutta säilynyt monia piirteitä vanha perinteinen omaisuutta. Iso ilo tämä ominaisuus on iso rivitalo alueita ympäröi aidattu puutarha jossa puita ja kukkia, että voit nauttia eri vuorokaudenaikoina. Tilava terassi on ihana suojaisa paikka varjossa tarjoamia puita tai katettua terassia, ja väri tarjoamia pussitettu kukkia. On runsaasti tilaa ottaa aurinkoa, nauttia näkymistä ja upea auringonlasku, tai syödä ulkona; on myös kivestä rakennettu grilli täydellinen ruoanlaitto ulkona. Onko haluat nauttia aamiaista ja ateria, tai aurinkoa hän allas, nauttia vehreiden kukkuloiden ja vehreä maaseutu, puutarhakalusteet ja aurinkotuolit ovat käytettävissäsi. On pieni terassi, pois olohuone näkymät merelle. Pohjakerroksessa, pois toinen kylpyhuone, on pesukone. Olohuone / keittiö: Ovi aukeaa tilava olohuone, jossa kaksi sohvaa, ilmastointi asettaa, ruokapöytä ja ikkunat näköalalla puutarhaan ja kukkuloille. Keittiö, samassa huoneessa, on varustettu jääkaappi, pesuallas, 4 rengas liesi, liesituuletin hauskaa, vedenkeitin. Pois olohuone on täysin kaakeloitu kylpyhuone pesuallas, wc ja kylpyamme ja suihku. Vuodesohva mahtuu ylimääräinen henkilö, tarvittaessa. On pieni terassilla, pois olohuone näkymät merelle. Huset är charmigt, har 3 bra sovrum och ett kök som går utmärkt att använda. Det som verkligen står ut är ytorna utomhus med utmärkta möjligheter till att antingen sitta i solen eller njuta av miljön i skydd från solen. Poolen är väldigt fin och var en självklar samlingsplats för oss efter vi varit på stranden. Allting är mycket välskött och man kommer och städar vart 3-4:e dag. Vi är mycket nöjda med vår tid, jag har varit där med min tonårsdotter i 2 veckor och vi fick lugnet vi var ute efter. Kan absolut rekommenderas men man skall ha med i beräkningen att bil krävs. Great location for exploring the beautiful Island. Cottage was very clean and it was a lovely surprise to receive home cooked food and some home made wine from Dimitris's mother. The only downside was the double bed was really uncomfortable. Was a truly lovely holiday, just wish it was longer. Thanks a lot for taking time to leave us a review. Υour comments will help us improve the quality of home facilities. A real escape from everything if required. It has all one needs to remain in Blue Cottage for days without venturing out if you wish. Terraces, barbeque and pool made it self sufficient for us, venturing to supermarket every few days. Best beach in Limnonari, 15 minutes away where Apenema restaurant offers great food and service with a smile. The only comment we would make is the mattress in main bedroom we found to be a little hard. Otherwise the owners were kind and considerate, visiting every 3 days to clean and change linens. A wonderful cottage which holds sweet memeories. Thank you for the kind and honest words! It was a true pleasure to have you in our cottage and we hope to see you again soon! Wunderschöne Unterkunft in den Bergen. Wir verbrachten 2 wundervolle Wochen in dieser traumhaften Umgebung. Das Grundstück ist gross - wir durften reife Früchte pflücken und den Steinofen nutzen, in dem wir Fleischspiesse und Fisch gegrillt haben...Die Vermieter sind sehr nett und kommen alle 3 Tage, um den Pool und die Blumen zu versorgen. Wir kommen gern wieder!! Beautiful little house in the mountains. We spent 2 wonderful weeks in this fantastic setting. The property is large - we were allowed to pick ripe fruit and use the stone oven, where we grilled meat and fish ... 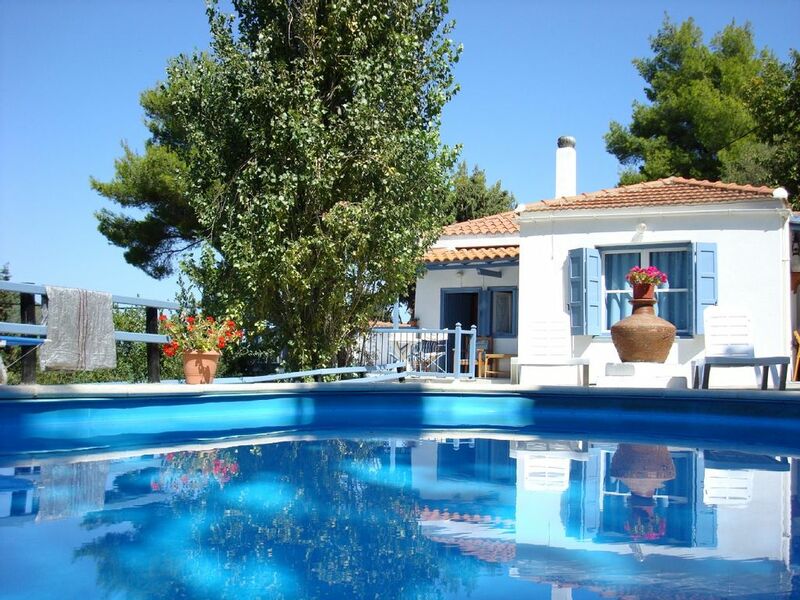 The owners are very nice and come every 3 days to supply the pool and the flowers. We would love to come back! Nach der Internetrecherche hatten wir ja eine Vorstellung von dem Anwesen, unsere Erwartungen wurden allerdings um ein Vielfaches übertroffen. Wir durften hier 3 wundervolle Wochen verbringen. Das Haus ist wirklich traumhaft und sehr privat, absolute Alleinlage im Berg. Die Ruhe und Stille sind grandios. Die Vermieter, Dimitris und seine Eltern, sind sehr gastfreundlich und aufmerksam. Haus und Anlage sind sehr sauber und gepflegt. Alle 3 Tage werden Haus, Anlage und Pool gereinigt sowie die Handtücher, die Pooltücher und die Bettwäsche gewechselt. Dimitris Eltern, die für den Reinigungsservice zuständig sind, sind sehr rücksichtsvoll. Bevor sie das Grundstück betraten, hupten sie in der Einfahrt, um ihr Kommen anzukündigen, warteten noch einige Minuten ab, bevor sie das Tor passierten. Sehr diskret. Die Gastgeber verwöhnten uns mit selbstgemachtem Skopelos-cheese-pie oder angesetztem Likör ..., herzlichen Dank dafür, es hat uns ausgezeichnet geschmeckt. Wir haben uns nicht wie in einer Unterkunft, sondern wie in einem Zuhause gefühlt. Wir liebten dieses Haus. Auf diesem Weg nochmals ein herzliches Dankeschön für den entspanntesten Urlaub, den wir je hatten und liebe Grüße nach Skopelos. What a wonderful place to stay. So peaceful often the only sounds were the tinkling of the goat bells on the hills and the crickets. Even though the photographs are beautiful the reality is even better. Picking figs, grapes, apples and plums from the terraced gardens was an unexpected treat. The outdoor spaces are extensive and beautifully planted and arranged. indoors is very well equipped and comfortable housed 5 of us. Dimitris and his family could not have been more helpful keeping the cottage spotless with regular visits and bringing us wonderful homemade treats each time. I have travelled extensively and never usually bother with reviews but this stay was so exceptional I had to write a review. Wish we were back there! Thank you very much for your lovely review! We are glad to know that you had a enjoyable stay. It was a pleasure having you and your family in Blue Cottage. Hope to see you again! PYRGOS ALUE: loma alalla Pyrgos sopisi niille, jotka haluaisivat olla kaukana kauniista rannoista Skopelos ja pane pahaksesi pois - mutta helpon matkan - Skopelos. Alue koostuu metsäinen rinteillä, oliivi-, luumu tai manteli hedelmä-ja viinitarhojen. Pyrgos on harvaan asuttu ja loma täällä on yleensä rauhallinen tapaus. Rental basis is per property, when occupied by 2 people. Add 10% per every extra person. Bed-linen and towels changed, cottage and pool cleaned every three days. All water, electricity and taxes included. We will be waiting for you at Skopelos harbour to transfer you to the cottage and show you how everything works. The local transfer from the port to the 'Cottage' is included in the rent.